My first try at a gingerbread house led to a little bit of frustration, as the royal icing which came in the kit I was using, just wouldn’t hold the house walls or roof up. Fast forward a few years, and I’ve found a great royal icing recipe (No problem holding those walls up! ), and have learned a few tips and tricks to make the experience even more fun. 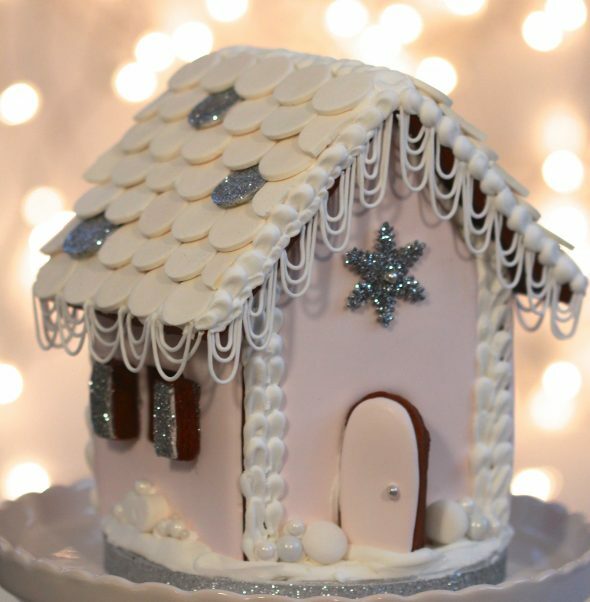 I’ll be sharing my recipes and gingerbread house tutorial videos in this post, as well as a little how-to on this specific house. You can find my gingerbread cookie recipe here and a video on how I make my gingerbread house royal icing here. (Recipe included there as well). Here is the template I used to cut the gingerbread house pieces out, along with a video on assembling the gingerbread house. 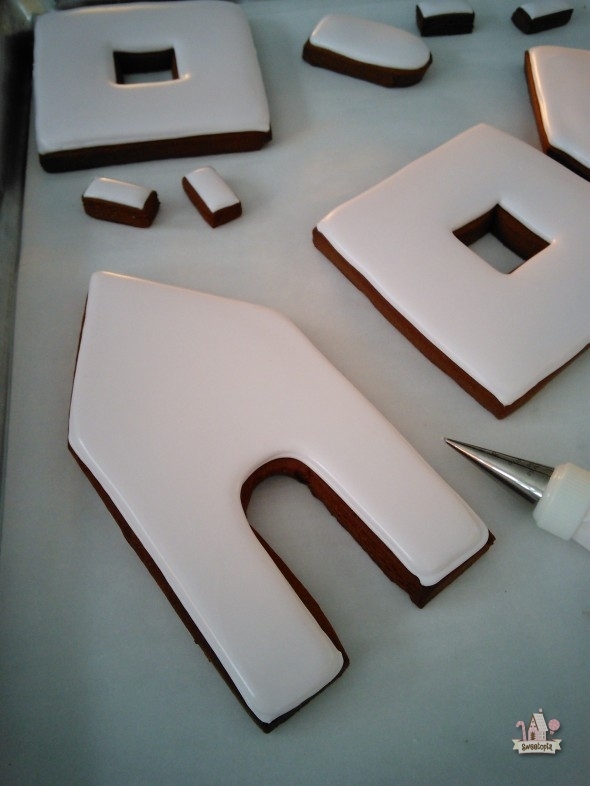 For this year’s house, I went light on the candy, but flooded the house pieces with royal icing instead. (More on that below). If you’re looking for a few ideas, here are a few of mine from previous years, a collection of ideas on Pinterest, and if you’re interested in going a little more detailed, I love Teresa Layman’s books ! One of my favorite candies to use on a house for roof tiles, are Necco Wafers . You could make them from fondant as well, but I love the already made wafers, and they come in such pretty colors too. 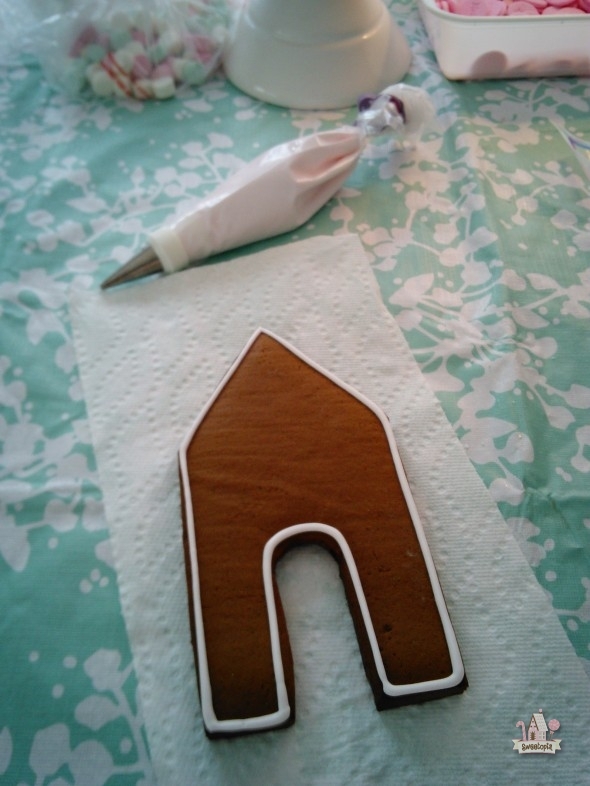 I used a pale pink royal icing and a piping tip #3.5 to cover my gingerbread house pieces. (Sorry about my dark phone pics here!). 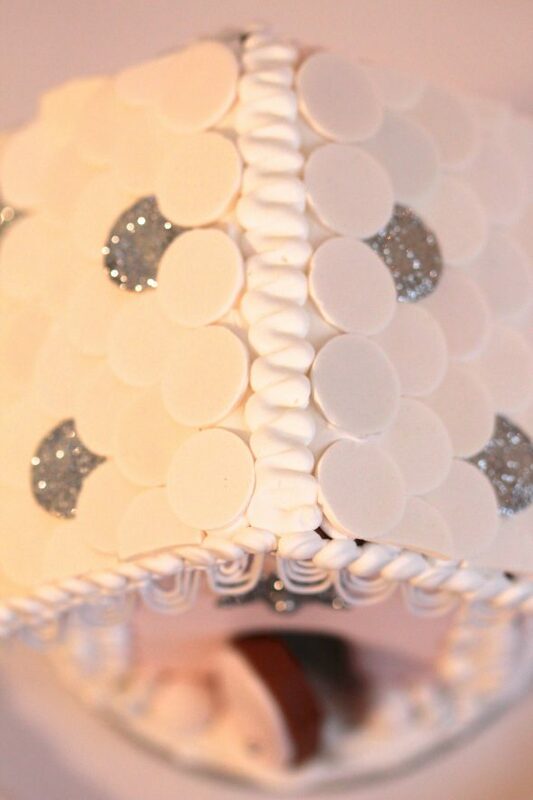 For a how to video on flooding with royal icing, click here. Consistency of the icing is key. If you’d like to see a video on that, click here. After I let the pieces dry for about 7 hours, I assembled the walls, let those dry for about an hour and then put on the roof. I was a little rushed for this house, so normally play it safe and wait at least overnight to put the roof on, but the humidity in the air was low and the icing was drying quickly, so it worked fine! Add your candy before or after you put on the roof – it’s up to you! 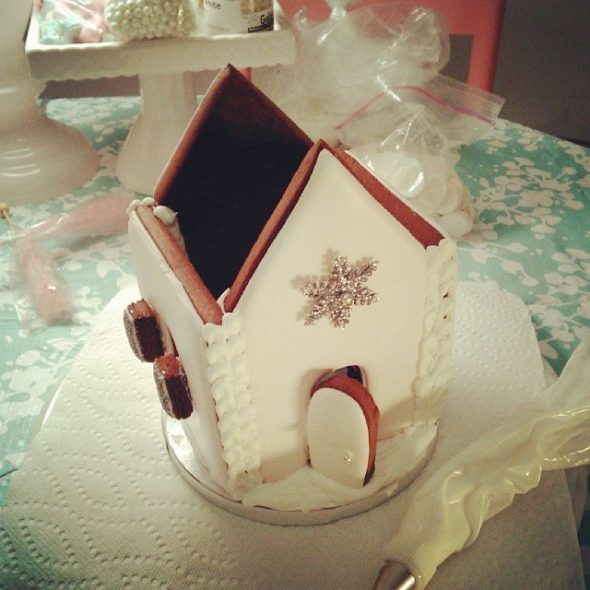 Once the roof was dry, I added the roof tiles and the royal icing hanging loops or swags were made using a #2 piping tip and stiff gingerbread house royal icing. There were fun to pipe, although I’m looking forward to practicing, so that I can make them more even. 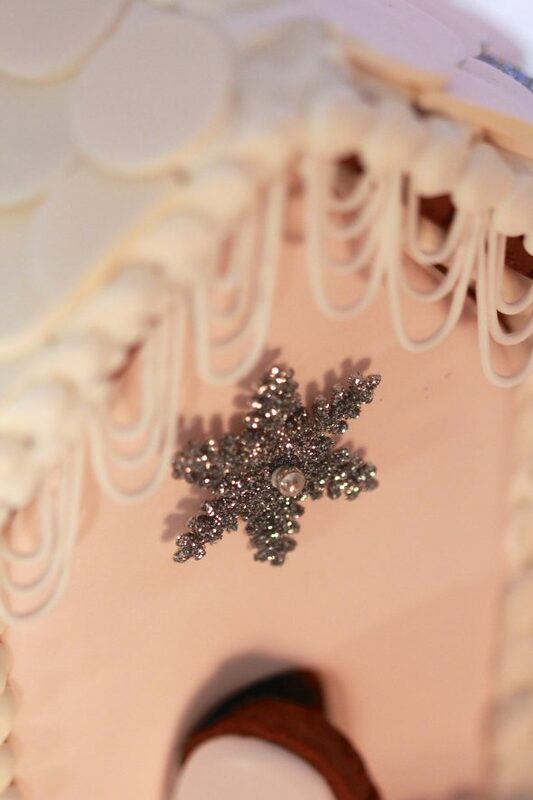 A how to video on the fondant snowflake (made using a medium sized PME snowflake cutter , can be found here. 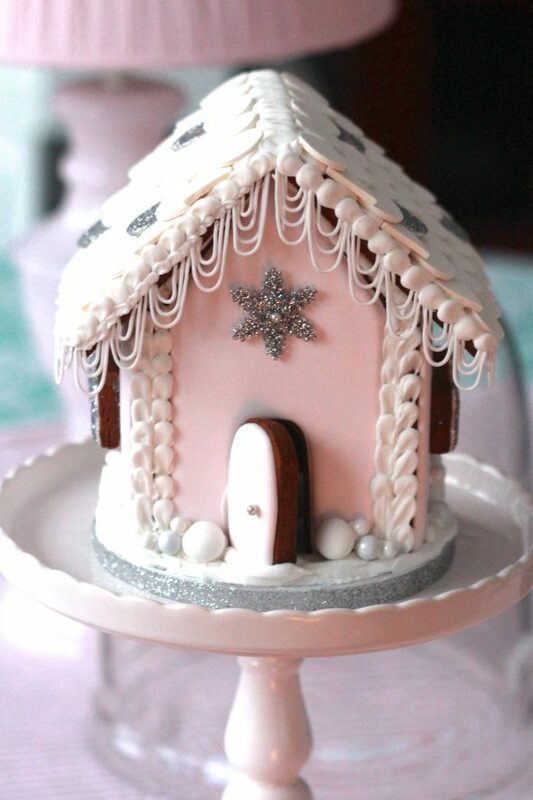 Thanks to Holly’s Sweets and Eats for the idea of using random glittery roof tiles! 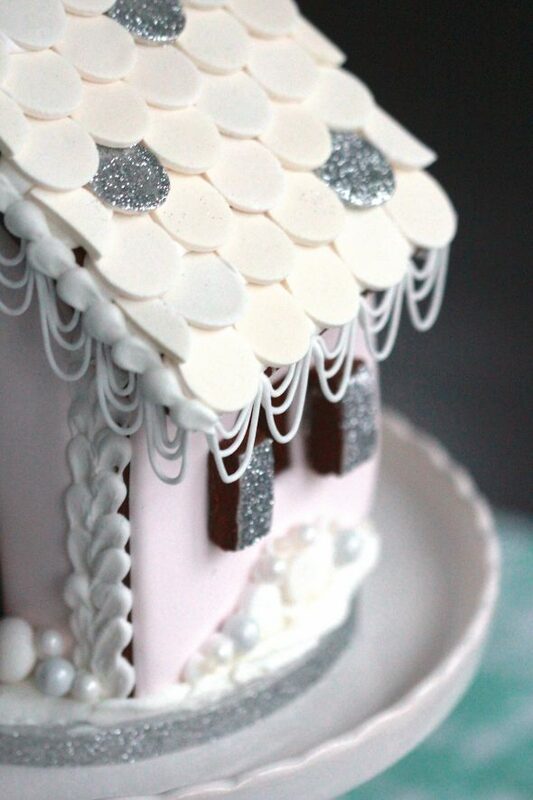 Besides the ribbon around the gingerbread house base, all the other silvery glittered items are covered in disco dust. Important to note is that disco dust is considered non-toxic, but for food decorative purposes only. 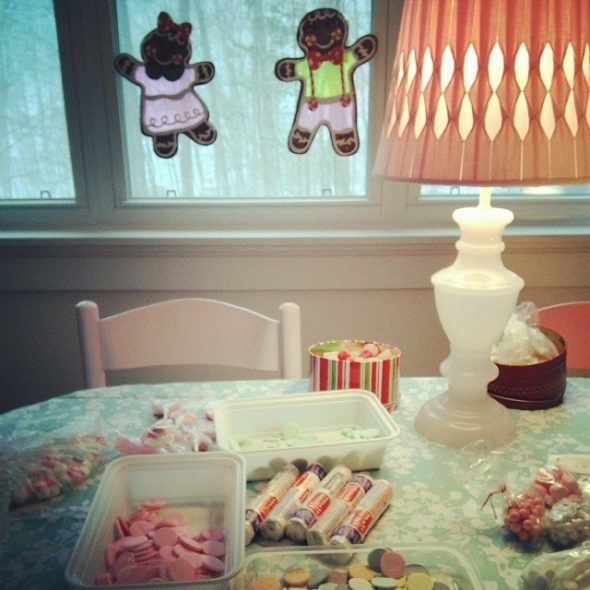 Make sure your gingerbread house recipients know to remove the disco dust items if they’re eating the house. Are you making a gingerbread house this year? I’d love to hear about your gingerbread house experiences, or would love to see pics of your houses too, if you’d like to share links in the comment section below, or on Facebook, Google+ etc.! Hi Rach! How did it go? I’ll bet the kids LOVED it! Using your gingerbread tutorial from last year as inspiration, I made 6 gingerbread houses as well as a large gingerbread woman and smaller ones. These were all used for a family Christmas tea I hosted last Saturday. The houses were a huge hit! Here is a link to my blog post about the tea, showing pics of the houses, too. Thank you very much. This post answers to lot of my questions. I baked parts for my first ever gingerbread house yesterday and now with your help I am bit more confident when assembling it. I made one last year , not planning to do this year as don’t have that much free time. I wish i had time to make as i love the one you have made. Just gorgeous! You are so talented, this gingerbread house is amazing! Brilliant choice of colours and decorations, just wow! Wow, that house is absolutely stunning – a true work of art! I know what you mean about being hooked! Clicked on the link but it says the “content is unavailable”. I’ll bet your castle is amazing! Oh dear, what can I say.. like I said in your previous blogpost, I am such a fan of your gingerbread houses, love them SO much! Thanks for so many tips on making a gingerbread house. It does take effort but also brings joy! Hope you have fun making one too! Beautiful. Thanks for another great tutorial. Incredible!! I never would have thought to ice the walls beforehand. Simply amazing! Love those icicles! You outdo yourself every year! Sigh, this is so beautiful. I want to make one this year from scratch. I cheated last year by using a pre-made box (gasp!). But this year, I want to bake the house and decorate it all on my own. It’s soooo cute! I just “liked” it on Facebook. Thanks for sharing! I said it on Facebook and I’ll say it here – your gingerbread houses are the best. So whimsical. 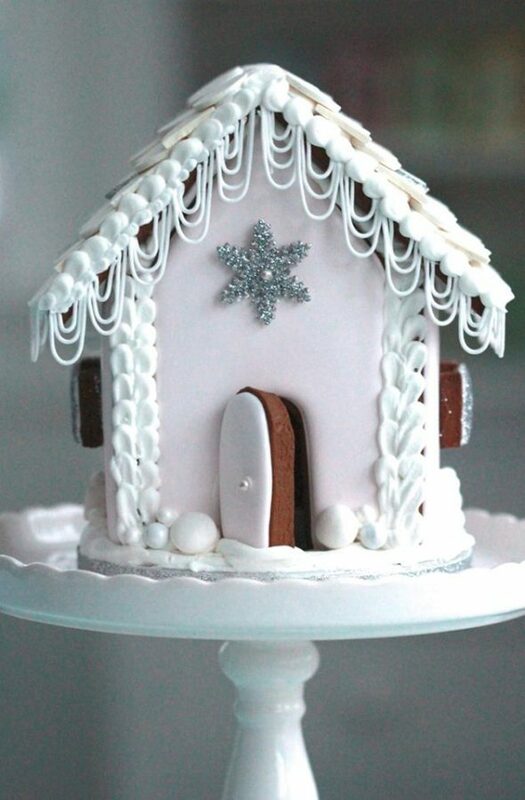 I will be attempting your pink gingerbread house from a couple of years back for Christmas this year. May I ask what size board you use under your gingerbread house please? 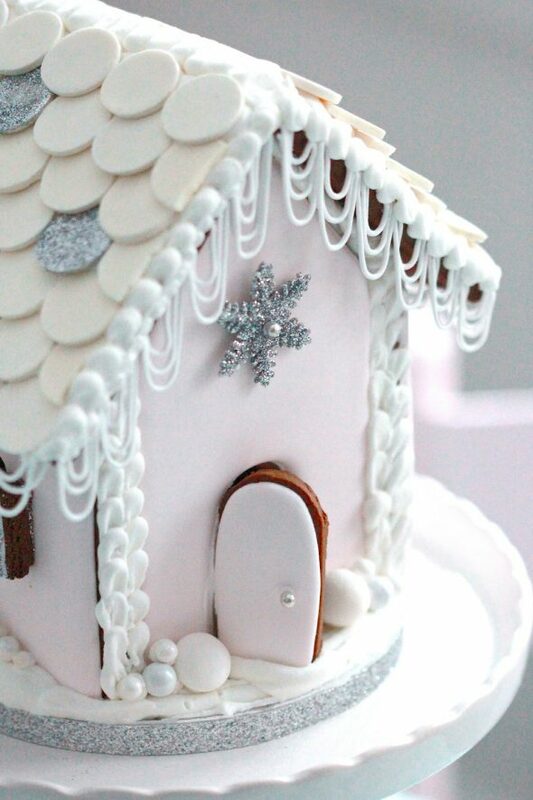 I love the pink and silver color scheme – such a beautiful gingerbread house. I’m inspired…but uncertain. We’ll see what the week brings. Thanks for sharing! Hi Marian! I’m panning on visiting an Old Time Confections soon to pickup some candy for my gingerbread house this year (I’m in Brampton so it’s not too far from both locations). Do you recommend the Barrie location or the one in Upper Canada Mall? Yay! I actually haven’t been to the one in Newmarket yet, but maybe a quick phone call to the store to see if one is larger than the other? Have fuuun shopping and with your gingerbread house! This is the most elegant gingerbread house!! ok, you blow all the other gingerbread houses out of the water!! this is so stunning and elegant!!! where do you find the time to do this?! you’re awesome!! Here is my slightly Dr Seuss/winter wonderland inspired design.. I love them – they’re all beautiful, Anjum! wow…. 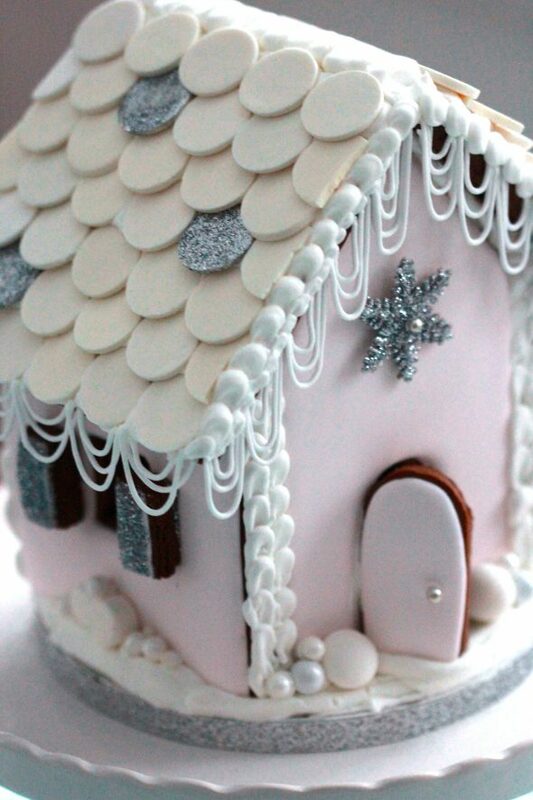 wonderful work,gorgeos, elegant gingerbread house. I love it very much.The icicles are amazing.You are so talented and thank you for sharing all your knowledge. I see on this house you put windows on the side, what size are the windows in inches. I would like to know for when I make my house so they are proportional to the rest of the house. Thanks! I used a small square cutter (Just over 1 inch), and then cut that in half for the shutters. Have fun with your house! Do you have to think out your royal icing at all? I am such a huge fan of your gingerbread houses! I seriously adore them! I love that you flooded the house walls before putting it together…so smart! Thanks Katrina and everyone for your comments! Wow, that is a fantastic looking gingerbread house! Marian, your houses are so beautiful, and I love, love, love your blog. I’m always inspired by your beautiful creations!! I’ve made several gingerbread houses, and have participated in a few local competitions, too. Nothing major. This year I made this Gingerbread Country Church for a local Pittsburgh fundraiser competition….and won first place for the adult division! Sooo beautiful, Dawn! That must have taken a lot of time and love! FABULOUS job! I used your house templates and loved giving you credit in my post. Thanks for helping me with the Camp Grandma craft projects. You guys did a fantastic job! Love it! I live in the U.S., do you have any idea where I can purchase the candies you use on your houses, i.e., Necco wafers in white,and the little pearl looking candies and the glitter dust? Your houses are absolutely adorable! You have inspired me to try to make the first one ever using your template and recipes. Candy.com is a great site for starters, and I actually like Amazon too. You can find almost anything on there! Thank you so much for all the incredible inspiration! Anna, it’s soooo cute! I love the mushrooms and the pink roof tiles! Gorgeous job! your gingerbread house is so pretty do you think thank it would be the same if you did the loops in white fondant. Hi Marian! I love your work and your gingerbread houses are amazing! I plan on attempting to make 7 of them for my daughter’s gingerbread house and cookie exchange birthday party this year. I’m a little worried about time management because I have to make other food for the party, several batches of cookies and her birthday cake. Would it be possible to freeze the dough ahead of time and defrost it when I’m ready to bake the houses? I was thinking about making the dough and cutting out the parts and maybe freezing it a few weeks before and then baking them in the days leading up to the party. Do you think this would work? Thank you so much!!!! I love your gingerbread house. I’m currently in culinary school and my final for my baking course is to make a gingerbread house. Since we are past Christmas and will be past Easter in May, our theme is Children. Any thing at all to do with Children! I have never made one so I need something fairly easy. Any ideas or pictures? Thanks for the awesome tutorial! I made it this past week and it was so much fun. Wonderful! Glad you had fun!